The case of a historic Carlisle building that caught fire is now being investigated by police as an arson. The Ukrainian Club, on the corner of Silloth street and Wigton road, was set ablaze on Friday 14 July, around 4:30pm. Police say significant structural damage was done as a result of the fire and are appealing for any witnesses who may have seen anyone in, on, or leaving the building before the fire started. Anyone with information can call PC 2524 Donaldson by calling 101 and quoting log number 176 of the 14th of July 2017. Crimestoppers can be called anonymously on 0800 555 111. Cumbria Police are asking for people with information about an arson attack at Kirkby Lonsdale to get in touch. They say the suspect is believed to have used a torch lighter fluid to start a fire behind the victim's back door. The attack happened at a house at Lunefield Garde over the May Day bank holiday weekend. A number of garden chairs and pots were damaged. Anyone can contact the police by emailing 101@cumbria.police.uk, by telephoning 101 and asking to speak to PC 2339 Katherine or anonymously through Crimestoppers on 0800 555 111. Police in the Scottish Borders are appealing for witnesses following a suspicious fire in Galashiels. The incident happened around 1am this morning in Scott Park. A plastic bin was set alight before the flames spread to the swing set and rubber ground cover. Police say the park sustained significant damage and inquiries are ongoing to trace those responsible. Officers are particularly keen to trace two young people seen running away from the area at the time the fire broke out. "The Scott Park is popular for dog walkers and families and this mindless act of destruction means that the bin will be out of use until it can be repaired. "We are pursuing various local lines of inquiry to trace the culprits and would urge anyone who saw anything suspicious in the area, or who has information relevant to this investigation, to contact police immediately." Anyone with information can contact Police Scotland on 101 or call Crimestoppers anonymously on 0800 555 111. Arson attacks account for more than a third of fires in Cumbria, according to new figures. During 2015 and 2016, 38 percent of fires in the county were started deliberately. In Allerdale there was a 20 percent increase in the number of arson incidents. An arsonist has been jailed for setting fire to a bed inside a house while his wife and three children slept. Thomas Galloway, 22, of Thomas Street, Carlisle was sentenced at Carlisle Crown Court today to five years for arson with intent to endanger life. At 5am on 17 April police were called to a house fire at a property on Thomas Street in Carlisle. Following police investigation it was established that Galloway started the fire deliberately. While nobody was injured, extensive damage was caused to the property. 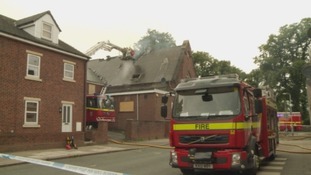 Police have arrested a man in connection with a house fire in Carlisle. Fire and Rescue Services were called to a property on Thomas Street at around 5am this morning. One of the occupants at the address suffered minor injuries. Following a joint investigation with the fire service, a 21-year-old man from Carlisle has been arrested on suspicion of arson with intent to endanger life. He is currently helping police with their enquiries. Homes had to be evacuated and three teams of firefighters were callled to battle a blaze that appears to be the latest in a series of grass fires deliberately set alight in Dumfries and Galloway. Some of the residents who were led from their homes were in their seventies, as large flames came within just a few feet of properties. Police say the fire near Sanquhar is one of eight suspicious grass fires in the past six days. Ten homes had to be evacuated in Kelloholm, in Dumfries and Galloway, after a grass fire came within a few feet of residents' gardens. Many of those evacuated were people over the age of 70. One resident described it as "an inferno" and said "it was a very frightening experience".